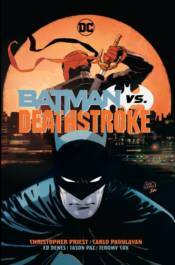 When Batman discovers a mysterious package containing DNA test results proving that he is not Damian Wayne's biological father, the Dark Knight sets his sights on his son's true father-Deathstroke! But Damian Wayne can't really be Slade Wilson's son-can he? And who sent the package-and why? The ultimate custody battle ensues as the World's Greatest Detective and the World's Deadliest Assassin clash in stories from the pages of DEATHSTROKE #30-35.